First Children Are Smarter—but Why? "Those born earlier perform better in school"—and according to a new study, it's because of the parents. Moms and dads simply go easy on their later-born kids, according to data analyzed by economists V. Joseph Hotz and Juan Pantano, and as a result, first-born children tend to receive both the best parenting and the best grades. The first thing to say about a study like this is that lots of readers will reflexively disagree with the assumption. With kids, as with anything, shouldn't practice make perfect? Don't parents get richer into their 30s and 40s, providing for better child-rearing resources? I'm a first child, myself, well-known within the family for being unorganized, forgetful, periodically disheveled, and persistently caught day-dreaming in the middle of conversations. For this reason, I've put stock in what you might call the First Pancake Theory of Parenting. In short: First pancakes tend to come out a little funny, and, well, so did I. And so do many first-borns. But international surveys of birth orders and behavior (which might have offered me an empirical excuse to behave this way) aren't doing me any favors. First borns around the world, it turns out, have higher IQs, perform better in school, and are considered more accomplished by their parents. Looking at parent evaluations of children from the National Longitudinal Survey of Youth in 1979, the researchers found that mothers are much more likely to see their first children as high-achievers. 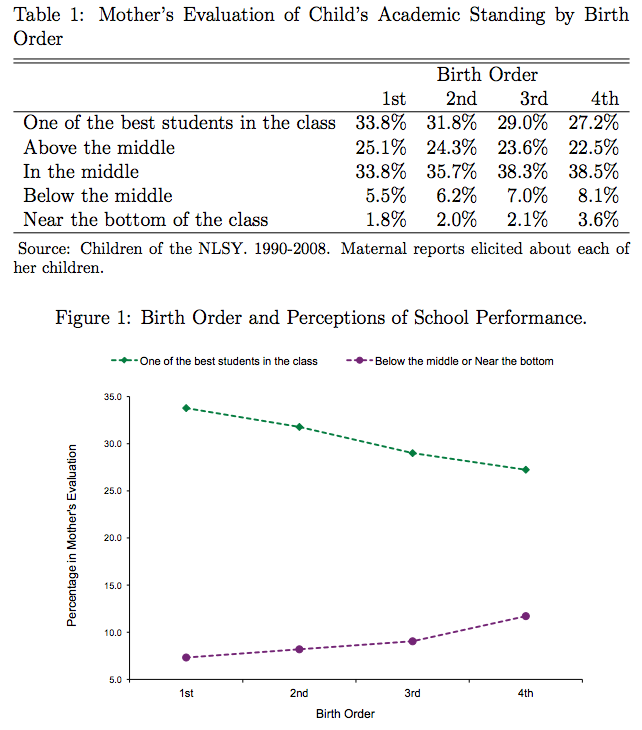 They regard their subsequent children as considerably more average in their class (see table and chart below). Let's briefly count off and nickname some of the leading older-kids-are-smarter theories reviewed by the economists, which push back against the principle of first pancakes. 1) The Divided-Attention Theory: Earlier-born siblings enjoy more time, care and attention than later-born siblings because attention is divided between fewer kids. 2) The Bad-Genes Theory: The strong evidence of higher IQs among first children leads some to believe that later kids are receiving diminished "genetic endowment." 3) The I've-Had-It-With-Kids! Theory: Some parents decide to stop having more children after a difficult experience raising one. In that case, the poorer performance of later children isn't genetic, so much as selection bias: Some parents keep having children until they have one that's so problematic it makes them say "enough." 4) The No-One-to-Teach Theory: This is the idea that older siblings benefit from the ability to teach their younger brothers and sisters. Building these teaching skills helps them build learning skills that makes them better in school. 5) The Divorce Theory: Family crises like divorce are far more likely to happen after the first child in born (first marriage, then divorce, then a first child is not a common sequence) and they can disrupt later kids' upbringing. 6) The Lazy-Parent Theory: The general idea here is that first-time parents, scared of messing up their new human, commit to memory the first chapter of Battle Hymn of the Tiger Mother but by the second or third child, they've majorly chilled out. Hotz and Pantano settle close to Theory (6). Parents are more likely to make strict rules (about, e.g., TV-watching) and be intimately involved in the academic performance of their first children, according to survey data. They're also more likely to punish their first child's bad grades. Hotz and Pantano say moms and dads start tough and go soft to establish a "reputation" within their household for being strict—a reputation they hope will trickle down to the younger siblings who will be too respectful to misbehave later on. The theory is interesting but not entirely persuasive. First it seems nearly-impossible to test. The survey data is much better at showing that parents chill out as they have more kids than at showing that parents chill out *because* they're explicitly establishing a reputation for strictness. Nothing in the paper seems to argue against the simpler idea that parents seem to go soft on later kids because raising four children with the same level of attention you'd afford a single child is utterly exhausting. What's more, if later-born children turn out to be less academically capable than their older simblings, it suggests that the economists' reputation theory is failing in families across the country.